Do you look around and think: There must be more than this to life? Are you looking for more joy, freedom and purpose in your life? I’ve been there. I spent many years climbing the corporate ladder as a business executive and strategy consultant. A chance meeting with a Mayan shaman caused me to begin to reassess my life, but it was a bad accident that left me stuck on my couch for six months, on crutches for eight, and in a cast for fourteen months that motivated me to make drastic changes in my life. Today I have reinvented every aspect of my life and am living a life that gives me freedom, flexibility and joy while doing work that excites me every day and makes an impact on the world. 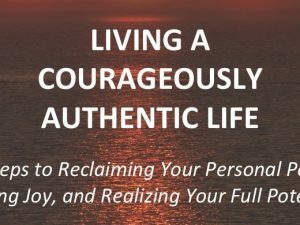 My goal is to help others reclaim their personal power, find joy and realize their full potential by living courageously authentic lives aligned with purpose. I find the course very helpful and powerful. I think it truly applies to self re-assessment and reflection at any time in your life. I see it as something you can go back to, and work through the exercises again to gain even more insights. If you are looking to truly transform yourself, your life, or both, then this is the course for you. Not only will you identify and push past deep seated limitations, but you will also experience a magical sense of alignment and connection with your true purpose and authentic self. Jennifer, herself a sparkling source of authenticity and inspiration, powerfully applies attuned skills as a shamanic healer and professional coach to insightfully give guidance, motivation and support through each transformational step. She will undoubtably push you forward in ways that you previously would not have believed possible. Can I honestly say that working with Jennifer made my dreams come true? Yes, I can...and much more! I just finished the second lesson in your course. It was AMAZING! At the completion of this self-paced program, you will have a much clearer understanding of who you are, what your life purpose is, and the life you want to create. You will also have vision plan of things you need to do, starting immediately, to help you realize that life.